He was the eldest son of Edward Ironside, city banker, antiquary and Lord Mayor of London who died in office in November 1753, Edward Ironside the younger became a Supercargo of the Honourable East India Company and was based in London. He married Elizabeth Havercamp and they had two daughters, Frances and Anna. In 1763 aged about 27 he came to live in Twickenham. Until 1777 he lived at No.6 Sion Row, but then moved to a house in King Street, almost opposite the turning down to Cross Deep, known as Spackman's Buildings. For years he collected information about Twickenham and eventually published a book The History and Antiquities of Twickenham in 1797. Much of this work had been assembled in the 1780's. It is, in places, inaccurate so that the information cannot be relied upon. He recorded the beating of the bounds between Twickenham and Isleworth late in the 18th century. The boundary ran through the middle of Twickenham Park House and was marked "in the hall...on the mosaic pavement...a small iron cross which divided the two parishes..."
In 1797 he observed that "The parts round Twickenham are greatly distinguished by the fertility of its well-cultivated garden grounds...large supplies of vegetables and fruits...strawberries...early peas...finest early flowers..."
Ironside was also an amateur artist. 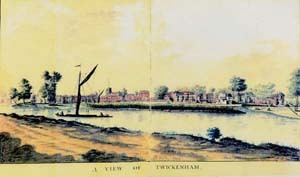 One of his best known pictures being a “View of Twickenham” dated 1786. Ironside died on 20 June 1803 and was buried at Twickenham on 28 June.